1L. Sadeghioon is currently with Orange Labs, France. 2A. Gravey (e-mail: annie.gravey@telecom-bretagne.eu), P. Gravey, and M. Morvan are with Telecom Bretagne, France. 3B. Uscumlic is with Alcatel Lucent Bell Labs, France. Metro networks support increasing traffic volumes and evolving traffic profiles. 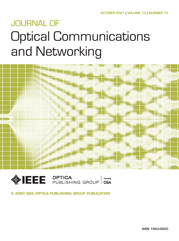 Revisiting metro network architecture, optical packet rings with packet optical add and drop multiplexing (POADM) features are proposed in order to support both optical transparency and subwavelength granularity. A medium access control (MAC) structure for multiring POADM networks is proposed, which can support multiprotocol encapsulation and provides the support of differentiated quality of service (QoS) and differentiated protection on a per-flow basis. Unicast and multicast flows are efficiently transported between stations, with a lightweight control within each station. An opportunistic insertion process associated with an appropriate scheduling process is shown to ensure transport network QoS levels. Simple models are provided to assess the transfer performance on the POADM ring. Per-flow protection mechanisms are proposed, and their efficiency is assessed. Dimensioning costs are derived, which take into account the number of used wavelengths and the number of fixed receivers required to support a given traffic matrix. Finally, it is shown that POADM rings can be used to directly support metro Ethernet services and thus allow collapsing the stack of transport network layers.